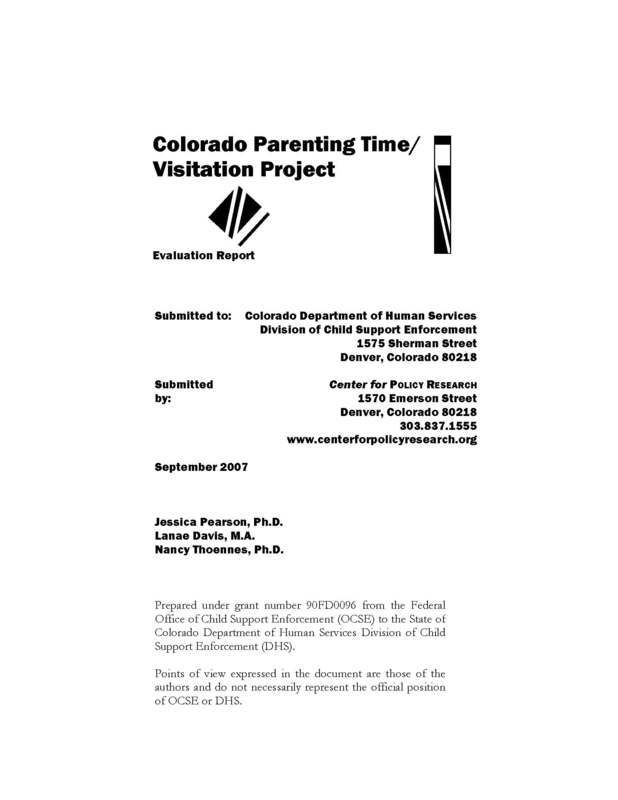 The Colorado Parenting Time Project was designed to assess whether identifying parents with visitation problems in the child support caseload and providing services aimed at resolving them improves parent-child contact and the subsequent payment of child support. Conducted in child support agencies in El Paso and Jefferson Counties, the project ultimately involved the identification of a total of 716 cases with visitation problems during May 2005 to December 2006, and their assignment to different groups for treatments of varying intensity: in both counties, a high-level treatment group was offered informal facilitation by the child access specialist (CAS), a specially trained worker at the child support agency retained with grant funds; in Jefferson County, a low-level treatment group was handed or mailed printed information about parenting time problems and various community resources to help parents with access problems, including free mediation and parent education services; and in El Paso County, an established unit within the child support agency (Parent Opportunity Project, or POP) offered noncustodial parents assistance with employment and parenting time using both facilitation and mediation techniques. The project evaluation assessed the number and types of parents who enrolled in the project, the services they received, and the outcomes they experienced. The study had two limitations that reduced the generalizability of the results and suggest the need for further research. These limitations included the recruitment of members of the high- and low-level treatment groups in Jefferson County from different pools of cases, with low-level cases being drawn disproportionately from cases being heard at the court for non-payment problems, and the provision of some level of in-person assistance with access and visitation to parents in every group — including the low-level treatment group, which was only supposed to get printed information.